(Reuters) - The International Olympic Committee (IOC) is facing its most serious bidding crisis in decades as cities drop out of the 2026 Winter Games bid race en masse, leaving a field of just two candidates. 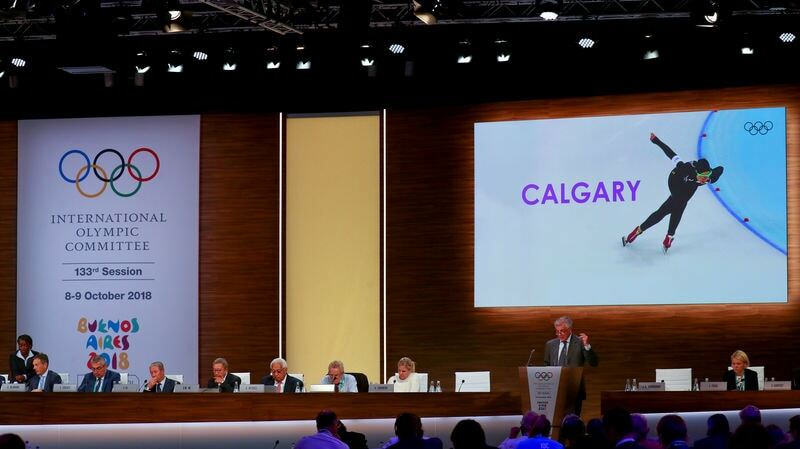 The Canadian city of Calgary on Tuesday became the latest to pull the plug on its 2026 Games candidacy after more than 56 percent of citizens voted against the project in a plebiscite, unconvinced the benefits of the Olympics were worth the multi-billion dollar investment. Of an original list of seven cities, only Stockholm and an Italian bid remain and both of those are struggling for local and governmental support. Calgary, which hosted the 1988 Winter Games, became the fourth city to drop out of bidding in mid-race, after Austria's Graz, Japan's Sapporo and Switzerland's Sion. Turkey's Erzurum was cut by the IOC last month. The two remaining bidders are Stockholm, which pulled out of the 2022 bidding process after baulking at the Games' cost, and the fragile combined Italian candidacy of Milan and Cortina D'Ampezzo. The Italian bid, which at one point included Torino before the city pulled out after a disagreement with the other two, is far from guaranteed the necessary political support amid the country's financial woes. Stockholm is facing opposition from a new city government which said last month it will be against any bid that includes taxpayer funding. The whole situation leaves the IOC, which will elect the winner in 2019, struggling to understand what has gone wrong after reforms in recent years under the 'Agenda 2020' and 'The New Norm' banners. Those programs were aimed at making bidding and staging the Games cheaper and easier but have failed to attract new cities. Instead, the exodus has increased, piling pressure on the IOC and its President Thomas Bach to stem the flow. "There is no Plan B," Bach said last month when asked what would happen if Calgary dropped out and if the IOC would consider other cities stepping in. Salt Lake City, hosts in 2002, is often mentioned as a potential quick solution for 2026. While the IOC has played down the exits, blaming the political climate in some countries or "outdated information" about the cost of the Games given to voters at referendums, there is concern among some of the international winter sports federations. "Naturally we are worried," a winter sports official who spoke on condition of anonymity told Reuters. "For Calgary it is also the percentage of refusal by the people that is of concern... We have to find solutions but we also have to be honest about the causes." "We have to find a way back to the local population. The efforts have not succeeded." This is not the first bid process marred by cities pulling out. Just two out of the six original bidders were left for the 2022 Winter Games vote back in 2015, with Beijing eventually winning the prize. Some have pointed the finger at Russia's Sochi 2014 Games and its staggering $51 billion price tag as the reason for the cities' lack of interest in the Games. The IOC directly awarded the 2024 and the 2028 Summer Games to Paris and Los Angeles respectively at the same time after several other cities, including Rome, Boston, Hamburg and Budapest withdrew. For Michael Payne, a former head of marketing at the IOC who has also worked with bid cities and Olympic sponsors, the 2026 bid process is not a major headache, given the IOC's healthy finances and broadcast viewing figures. "Even if other cities fall over it is not the end of the world. The IOC will fix the problem," he said. But he said Sochi's massive spending has had an adverse effect on potential future hosts. "People are still dealing with the legacy of Sochi," he said. (Russian President Vladimir) Putin thought that he was doing the movement a big favour by saying 'look what I am investing in the Olympics'. "But the IOC should have immediately stepped in. They were not firm enough at the time." Current IOC President Bach was elected four months before the Sochi Games, succeeding Jacques Rogge. The international ski federation (FIS) sounded confident the 2026 Games would find a high-quality host. "It will take time to educate the general public about the IOC reforms to the Games," FIS told Reuters in a written statement. "And for them to see first-hand in upcoming editions the effect of these new policies and practices, which is one reason behind the 'no' votes in the various referendums on the 2026 bids." "There still remain two very attractive bids in two FIS and winter sports key markets and we very much look forward to the 2026 Games taking place in either Sweden or Italy, who would both be excellent Olympic hosts with rich winter sports traditions."